It's taken me a while to get to it, but it's time to discuss ball rolling. (It's ok if you laugh). No, I don't mean using a foam roller and I don't mean tennis balls, but I mean rolling areas on tension and discomfort out on dense rubber balls intend to bring some relief. There are many kinds of tools at your disposal, actually, from dense lacrosse balls to small inflatable spheres, squishy foam rollers, vibrating balls, and more. and it can be difficult to figure out where to start. Why are you telling me to do this? Let's start with some questions: If you could have someone massage the big knots at the top of your trapezius every night, would you do it? When's the last time someone dug into your glutes in a massage? How's your IT band feel these days? Do you have neck pain or a tight jaw? Do you wear elevated heel shoes and have sore feet? Back pain? Knee pain? One sided shoulder issues? Here are some selections from my circular toolbox- the Melt Hand and Foot Kit, Yoga Tune Up® balls in a tote, and a lacrosse ball for comparison of density. Did you answer yes to any of these questions? Then rolling is for you! Without going super in-depth into fascia, adhesions, and knots (which i will definitely do another time), rolling out tissues can prepare your body for movement, rehydrate tissue, improve circulation, and create generally a better relationship in your myofascia. (Remember that early post about muscles/fascia/etc?) I wish musicians could have more regular bodywork sessions, similar to professional athletes, but we unfortunately don't get that treatment at a low cost. Ball-rolling is an amazing way to keep that change in your tissues on a daily basis after rigorous practice. Amazing chart from Soma System outlining the path of tension and pain in tissues, something musicians often feel they have to live with. Brooke Thomas, a rolfer, wellness lady and movement maven, goes through some of the benefits of foam roller vs. rubber balls vs. lacrosse balls here at Breaking Muscle, so give that a look. I started my rolling experience on lacrosse balls and then moved to Yoga Tune Up® balls, and am now a YTU® teacher, so I may be biased, but I do believe that rolling in general is terrific, and softer implements are generally better. -You control your own roll-out experience, spending as much or as little time and pressure on areas as you see fit. -More specific than a foam roller. -Rolling is a great way to continue feeling good after a massage, rolfing session, yoga class, etc, or to prepare the body for a specific task. -Rolling is great way to recover from some overuse and tension. There are a ton of great videos out in the internet (which I will share), as well as classes around the country in Yoga Tune Up® Classes, mobility workshops at Crossfit, MELT method classes, and Soma Systems, all of which are great ways to explore self care and myofascial release. What are your scapulae doing in a push up? Image from the Bar method. After another great weekend of assisting a teacher training, it's time to look a little deeper at what the shoulders are doing in push-ups or yoga push-ups, chaturangas. It can be extremely difficult to know what's going on behind you, not only because we can't see our shoulder blades, but also because most of the time, no one ever taught us how to do a push-up, other than "do it." It turns out that there's a lot more to it than that! One of the key players in stabilizing the shoulders in a plank, push-up, or any loaded position, is the serratus anterior. Often thought of as the "superhero muscles," they line the ribs in a serrated fashion, originating at ribs 1-8, and inserting at the medial border of the scapulae. The function of the serratus is to stabilize the scapulae, especially in protraction, meaning that the shoulder blades are wide on the back. What does that look like in real life? Take a look at this first video of me: I would not claim to be perfection, but I'm comparing two actions that often happen in push-ups. 1. In the first example, as my elbows bend, my shoulders blades glide together. This means the serratus anterior is not helping to stabilize the shoulder. Without fear-mongering, an unstable scapula in regards to push-ups and beyond can be problematic. 2. In the second example, as my elbows bend, I'm attempting to keep the shoulder blades wide on the back, an action called protraction. My serratus is firing to help that happen. If you don't know what's happening with your shoulder blades, have a friend video you in a push-up, or take the push-up to the wall, and just see what's going on as you bend and straighten your elbows. It's not that your shoulder blades should never come together in retraction, it's that you will be more stable and muscularly engaged if you weight bear in protraction. Here's another video looking at the actions of protraction and retraction in a weight bear position. I'm trying not to elevate my shoulder blades up towards my ears as I move my scapula on my back, although I'm not always successful at that! (Something to keep working on.) The intention is to build awareness in the back body, start to notice where your scapula are, and see if you can retain the broad/wide scapula position as you move into weight bearing positions like plank, and then progress to a push up. Last month I went to a yoga class which annoyed the heck out of me. The second posture of the sequence was full wheel (a deep backbend) followed by an optional handstand, which was just for starters, followed by a Taylor Swift dance break midway. These things were all terrifying in and of themselves, but the worst of it was when the teacher said that "chaturangas in a yoga class are like clowns in a clown car-the more you can fit in, the better." I don't always do (or teach) multiple chaturangas in a yoga class, which can leave some students perplexed. Why? Let's start with what chaturanga, as a yoga asana, is. This posture is essentially a yoga push up. Our environment is conspiring to keep you slouched, head forward, chest tight, and with weak shoulders. Your yoga practice may be making that worse! It's basically a half lowered down push up, but with a fancy sanskrit name. It occurs in the traditional Sun Salutation sequence, and can either be followed by upward facing dog, cobra, etc. As a strengthening pose, it focuses on pecs, anterior deltoid, and triceps, an area that is usually overly short (and often weak) in most people to begin with. Because of a combination of different factors, repeating this posture without strengthening the opposing muscles can create an imbalance in the shoulders, especially if the shoulder blades are not stabilized by the serrates anterior in the lowering phase. In addition, the transition to upward dog can be extremely challenging in and of itself. By emphasizing the front of the body, which is already restricted, most yoga asana ignores the posterior shoulder muscles, such as the posterior deltoids, the rhomboids, and the external rotators of your shoulder (infraspinatus, teres minor). Musicians in particular, tend to be weak in these areas from repetitive practice and lack of cross training. There are also consequences for wrists unused to bearing full weight in full extension (read my thoughts on that), as well as exarcerbating restriction in the front of the chest. I love this image from Jason Ray Brown-it's not that chaturanga is bad. It's mostly that we're overtargeting one side of the body and ignoring the rest, which can be a recipe for disaster if yoga is your primary movement pattern! What can you do instead? If you are someone who practices a style of yoga which might feature 25-50 chaturangas in each class, consider laying off of a few here and there, especially if you have past or current shoulder issues. Sometimes the movement gets accelerated to a point that quality of movement is compromised, which is not ideal either. I've restricted my chaturangas to 10 or less in a class, and added strengthening poses for the back of the shoulders and lats, as well as some weight training and hanging from a bar. (Also, look at what is happening in the your shoulder blades as you lower- if there is a lot of retraction happening, your serratus is not helping you to stabilize and create some external rotation.) Here's a quote from yoga teacher Jenni Rawlings, which summarizes my feelings completely. Before you throw it all out though, ask: am I doing pulling motions outside of yoga? In addition to lowering myself towards the floor, can I push myself up? How many chaturangas am I doing in comparison to other shoulder strengthening work? How many times a week do I practice a chaturanga heavy practice? As with all movements, the question is not whether the movement is "bad." It's whether or not your body is prepared to handle the load, magnitude, and frequency of the action. It's also about whether your shoulder is strong in many ranges of motion to support your work on and OFF the mat! 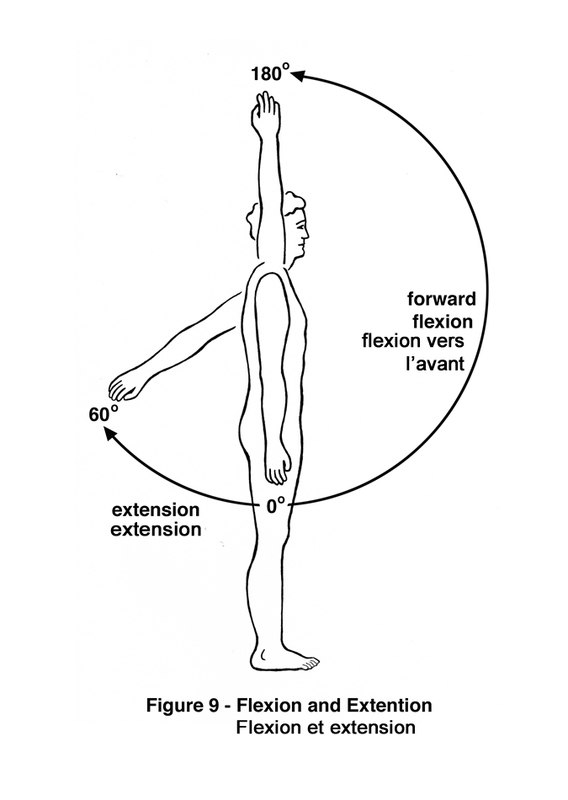 image from Leslie Kaminoff's Yoga Anatomy. The two yoga asana that are often touted as "the mother and father of yoga poses" are shoulderstand and the headstand, neither of which I teach. You may remember my thoughts on shoulderstand risks for musicians, and I thought it was time to tackle (and retackle) headstand and its risks (for musicians and normal folks too). I used to practice headstand and it *always* flummoxed me. I asked teachers about my alignment constantly, and yet I usually left class with a dull headache. I stopped practicing it unless absolutely necessary (like when a teacher comes over to you and asks what's wrong with you and why you aren't doing a particular pose in class), and even then, have often put up a fight. (PS. Any teacher, whether it be crossfit, yoga, Pilates, whatever, that doesn't respect your actual mechanical limits or your desire to perform a complex movement on any given day is probably not the right teacher for you). BKS Iyengar in supported headstand. Iyengar's teachings touted shoulderstand and headstand as the most important asanas, yet, they are precarious, and perhaps should not be held for as long a duration as has been taught in the last 50 or so years. Many of the supposed benefits may be true, but there's not much evidence based research out there. I do have colleagues who believe to have injured themselves from this posture, and certain styles of yoga encourage students to hold this posture for 5-10 minutes daily. More and more research based and anecdotal evidence is coming to light in regards to the hazards of headstand (and shoulderstand). 1) First of all, it always gave me headaches. Yup- It actually caused pain afterwards which usually subsided. Why? Because I found out two years ago that I have a pituitary tumor (non-cancerous), which means maybe I shouldn't put weight on my head like that. No amount of "benefit" is worth that for me, even though it should balance the very system that I have a tumor on. Did headstand cause my tumor? Most unlikely. Did headstand cause my headaches and occasional neck pain? Most likely. In a group movement class, you have NO idea what students are working with, and students may not themselves know what their limitations are. I certainly didn't know I had a tumor, and other students may not know they have "forward head position," neck challenges, or that they lack the strength to support themselves. Forearm balance- strength and range needed before even thinking of headstand! 2) Headstand requires a huge amount of shoulder strength in external rotation, protraction, and upward rotation of the scapula to name a few. A student would need to have impeccable alignment in forearm planks and dolphin, coupled with an ability to have stable shoulders in forearm balance before adding in a headstand. In addition, some classes and styles of yoga have students hold this pose for 5-10 minutes in class. We don't know what the long term damage can be to the neck and spine from holding a pose like this daily for that duration, so use your judgment! Lacking the range to attempt headstand or forearm stand. A starting range for attempting such postures- forearms can be parallel to the floor, shoulders protracted and supporting. 3) Not everyone has the range ability to get their arms over their head with elbows bent unloaded. Take a look at these pictures below: see how the forearms aren't parallel to the ground in the first image? If she then attempts a head stand or forearm stand, her body won't be able to get upright without some serious adjustments, possible with the neck taking too much load (poor delicate, highly mobile cervical vertebrae), her spine extending, or her shoulders getting shredded. Before even considering head stand, a student should have the pure range of getting their forearms parallel to the ground in standing without compromising the spinal integrity. This is a headstand adapter which takes the head and neck out of the equation. I'd say that you still need shoulder strength, but it's a nice alternative for inversion junkies. 4) Folks sometimes interpret headstand as time to jump on their head, literally. Whereas you can kick into handstands relatively safely, headstand kicking up is a terrifying prospect. Also, I hate being in a class where someone falls over backwards out of headstand-not only does it sound awful, it is painful. (And never go upside down near a door, window, or an open flame, folks!). In many ways, the foundations of handstands and forearm stands are much safer, both in terms of falling, and in terms of building long term strength for other poses and movements. If you are determined to practice headstand, add in the piking piece to gain strength in the lower body, rather than hopping up! 5) We've built up a false history for headstand; most yoga asanas are not thousands of years old-most poses were "created" and codified in the last hundred years. Attaching serious health and historical value to one or two poses (more than anything else) is ridiculous and unfair to practitioners for whom this is not suitable and will never be suitable. You can have a full beneficial yoga practice WITHOUT headstand, shoulderstand, or even downward dog! This doesn't mean that you (or anyone) can't practice that pose anymore, but be aware of the inherent risks involved and notice when it is not well instructed in a group class setting (in which the teacher doesn't know every student's body, injuries, or abilities). If you're a teacher and you have the range and strength to perform the pose, you have to ask, "do all of my students understand what is needed here, do they have the pure range of motion, do they have the strength in their shoulders and serratus anterior, and can I instruct this in a way that everyone feels safe and supported?" 6) Lastly, many people have kyphotic standing and sitting posture, with necks a little forward and spine rounded. If that already exists, why are you going to add 150-200 pounds of weight to it? Even if the student is not misaligned in standing, headstand goes full throttle rather than gradually adding weight in the head and shoulders. A hundred years ago or more, people (especially in India!) moved differently- they might have carried loads on their heads, they might have had better posture, they might have moved more, walked more, etc. Nowadays, things are different-without head carrying, there's no pre-training of neck strengthening to even see if you can support any weight, let alone your whole body weight. If you're a musician who plays an asymmetrical instrument, you're more at risk for one side of your neck to be tighter/stronger/weaker than the other side. Combined with typical musician shoulder range and strength issues, poses that stress the neck should probably be avoided for many (many!) other more beneficial movements. Last thing- if someone of something tells you that a movement you love is perhaps unsafe or not beneficial, rather than getting defensive, look at the big picture. Why is this unsafe for you? What restrictions do you have? Do you lack strength or stability? If you lack the range of motion in the shoulders or strength to support yourself in headstand, these are separate things that can be cultivated over time without doing the pose itself. If your neck vertebrae are fragile from previous injury, then it may not be worth it to take a risk. You only get one spine and one set of vertebrae (and discs!). Rather than seeing the pose as the end goal, look at the movements and ranges required to execute the pose and then ask yourself: why am I so attached to this pose, and does it matter if I achieve it? Doesn't any version or regression of the pose count as the pose? Does it make you a better person, yogi, or teacher to do the "full pose?" ...Just my thoughts on that. This is an anatomical cutaway of shoulderstand with the the hands and forearms on the ground. (Note the breast tissue is defying gravity and not descending towards the earth.) I can't remember where I found this, so I'm sorry! If you're not a yoga or pilates person, this particular blog post may be of little interest to you. My apologies. For everyone else, let me continue. I rarely teach full shoulderstand in a yoga class (or full jackknife in pilates), especially not to musicians. I've mentioned this before, but I realize that I should give some thoughtful explanation to some of my yoga musician friends who may be wondering what I'm thinking. First of all, yoga is not inherently beneficial, meaning that not all yoga poses are equal, and not all yoga postures will be suitable for everyone. There is sometimes a view that yoga cannot harm people, which is frankly a lie. People get injured in yoga classes, teachers get injured in yoga classes, and like any movement based activity, certain movements are riskier than others. With that in mind, let's look at musicians as a general population and some of their tissue issues. -We often have neck pain and neck injuries from Repetitive Strain and decades of instrumental study. - We often have limited ROM in our shoulders, weak shoulders, or shoulder pain. Iyengar was one of the most famous teachers of the 20th century who touted this pose as the most beneficial, as well as headstand. He is also built like gumby, and his lifestyle and body is not similar to most of my musician and yoga realm colleagues. He also does not have female breast tissue, otherwise he might have reconsidered the suffocating detriment of this pose. -We have often accepted a certain amount of pain from musical study as normal, which means we might not be able to detect destructive pain signals in weight bearing situations. -We have spectacular proprioception of hands, jaw, fingers, embochure muscles, etc, but don't necessarily have large muscular/joint proprioception. - We often have tucked pelvises and forward head position from sitting in a slouched chair for 6-8 hours a day. This is an awkward internet drawing of neck flexion. -It circulates lymph, it's an inversion which has inherent benefits, it's excellent for thryoid disorders, it soothes the nervous system (unless you're suffocating on your own breast tissue), it's good for fat loss (I'll believe that when there's a study), and will apparently relieve symptoms of asthma. Sorry for the cynicism, but I have always strongly disliked this posture because (suprise!) it doesn't feel great for my neck, I always feel like I'm suffocating in my own breast tissue, and I think there are better postures for musicians (and most yoga students) who already put stress on their neck ligaments and cervical spines. But I digress. There are two main actions needed for shoulderstand: full shoulder extension and full cervical (neck) flexion. 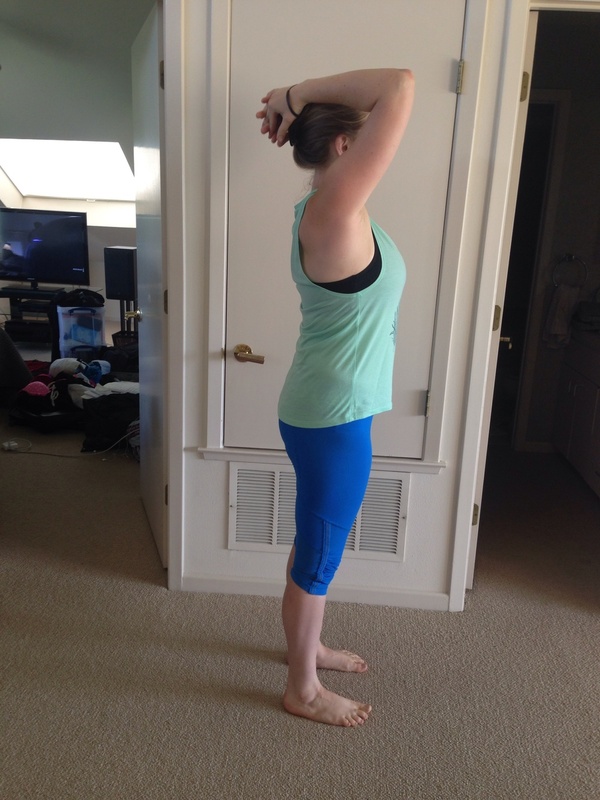 Here's the test I learned from the folks at Yoga Tune Up® which has alleviated my guilt from disliking this pose. 1. Interlace your hands behind your back. Lift your arms. 2. Do your arms end up being parallel to the floor when you lift up? 3. If you can get your arms parallel to the floor in full extension, do you distort your torso and neck? 4. Can you then also flex your neck fully to your chest with shoulders in extension? 5. If not, then why try and and invert when you'll be smooshing all your weight into your neck? Can you see why you need to be able to lift your arms to parallel? You're essential trying to make a 180 degree line between your flexed neck and your arms in order to support yourself. If I haven't done any stretches or shoulder work, here's my end range of shoulder extension. In order to get my forearms all the way to parallel, I lose the integrity of my posture and slouch. So here's a PT chart I found illustrating normal shoulder flexion and extension. The range needed for a safe shoulderstand is not normal for most people. See the cervical vertebrae spinous processes? (AKA. you dinosaur spikes?) Those are just some of your friendly body parts that can get hurt. "Viparita Karani" or legs up the wall for you non-sanskritters. Leotard optional. If you can't get your shoulders in extension parallel to the floor, why are you going to turn it upside and try to force your arms to the floor when you can't do it upright? It's an impossible task! Then, add some weight and you'll just end up crunching your neck. Sounds painful, right? Simply put, most people (especially musicians) don't have the shoulder capacity to do this pose safely, and their lack of range puts a huge strain on the neck, which is already a tricky place and source of pain for many of us. Added in that many people can't do the full range of neck flexion, (i.e. chin to chest) needed here, which is why there can be problems. Why try to put yourself into a posture that's not built for your body or most bodies? Do something that makes sense for your body and your range of motion, as well as your long term health. Or even better, start practicing movements that will prepare your body for that posture (if you really want to do it). Some people can (and do) have the range of motion and strength to do this pose safely. Others don't and have injured themselves. There are lots of supposed benefits to this posture, but not at the expense of your neck, folks! Try something a little more friendly, like viparita karani, which is a gentle inversion (getting you that lymph exchange and blood flow benefit). If you DO want to practice shoulderstand, here are some things to think about: do you have the necessary range of motion to perform it? How often do you practice the pose, and for how long? If you need to improve certain ranges of motion to perform the pose, are you working on those in your daily life (like improving shoulder extension)? Since I've started teaching pilates in the last few years, I've really enjoyed the different regressions and different approaches to a similar movement in the pilates repertoire, jackknife, which asks for less extreme ROM in the shoulders and spine, as well as a much shorter hold. Ouch! Believe me yet? Want to read more? : I like this article from Smarter Bodies and the ongoing work from Matthew Remski re: yoga injuries and asana.